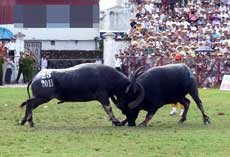 More than 30,000 spectators cheered the contestants in the final round of the 2011 Do Son Buffalo Fight in the Do Son district of Haiphong on September 6. One of the 15 national festivals, the competition takes place on the ninth day of the eighth month in the lunar calendar. The organizers held two qualifying rounds in the fifth and six months of the lunar calendar to choose 16 buffalos from the seven wards in Do Son district. The buffalos were divided into eight pairs and competed in a knock-out format to qualify for the semi-finals. The owner of the champion buffalo won VND40 million in prize money. The organizers are calling for investment from various sectors and individuals in the future, aiming to boost the festival and encourage the participation of more buffalos in the event, said Trung Hieu, head of the organizing committee. Source : Viet nam travel.